However, many aspects of the proposed army reform have yet to be clarified. On the one hand, Serdyukov has listed numerous revolutionary concepts of interest to both civilians and the military, including plans to cut the number of vacant officer positions. Moreover, Serdyukov wants to eliminate undermanned units that were to have been deployed to full strength in case of an all-out war, and whose officers now guard obsolete military equipment, and to replace the four-level troop-control system with a three-level equivalent. The army-division-regiment triad will now give way to the tactical command - brigade tandem comprising "modular" task forces that, in turn, would consist of motorized-rifle, tank and reconnaissance battalions, artillery and surface-to-air missile (SAM) battalions, as well as mobile telecommunications and logistics-support units. Such units will operate in conjunction with air force units, receiving information from them and Space Units. Coastal-defense units and warships will also support them whenever possible. 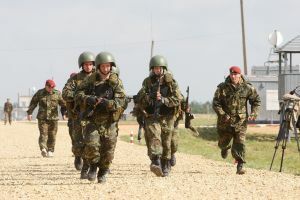 The Kremlin and the Defense Ministry have summed up the results of the August 2008 peace enforcement operation against Georgia that attacked its break-away province of South Ossetia. Even the most conservative military leaders now realize that army brigades are the most progressive and effective fighting units. However, some generals doubt that such units can operate effectively everywhere. Their doubts are facilitated by Serdyukov's failure to explain changes in line with specific concepts and doctrines. It is also unclear exactly for what conflicts the Russian army should prepare, and what theoretical enemies it could face in the next 15 to 20 years. Any army reform seems pointless without these basic assessments. Under a scenario that would pit Russia against U.S. and NATO Armed Forces, it should expand its strategic nuclear forces and the aerospace defense system. At the same time, NATO and U.S. forces would continue to outnumber Russia's Army and Navy in the foreseeable future. This can be explained by the national financial-economic situation, the current state of the Russian defense industry and the structure of this country's Armed Forces. However, inter-continental ballistic missiles (ICBMs), submarine-launched ballistic missiles (SLBMs) and air-launched cruise missiles (ALCMs) will always prevent Western leaders from taking any drastic action against Russia. Russia's strategic nuclear forces now have 682 ballistic and cruise missiles with 3,100 nuclear warheads. The Strategic Missile Force has 430 missile systems, including 75 R-36-MUTTKH and R-36-M-2 Voyevoda (SS-18 Satan) ICBMs, 100 UR-NUTTKH Sotka (SS-19 Stiletto) ICBMs, 201 land-mobile Topol (SS-25 Sickle) ICBM systems, 48 silo-based Topol-M (SS-27) ICBMs and six land-mobile Topol-M systems. The Navy has 14 strategic missile submarines, including six Project 667-BDRM submarines with 92 R-29RM Sineva (SSN-24) SLBMs and two Project 667-BDR submarines operated by the Northern Fleet. The Pacific Fleet has four more Project 667-BDR submarines. The six Project 667-BDR submarines carry 81 R-29R Skif (SSN-23) SLBMs. The Air Force has 15 Tu-160 Blackjack and 64 Tu-95MS Bear strategic bombers carrying 884 nuclear-tipped X-55 cruise missiles. However, ballistic and cruise missiles cannot be used against such adventurist and aggressive governments as the incumbent Georgian leadership. Reinforced general-purpose and rapid-deployment brigades are the most effective option for repelling conventional invasions and fighting insurgents and international terrorist units. Russia also faces other threats, including those posed by Al-Qaeda and the Taliban movement. U.S., NATO and Afghan units continue to fight them more or less effectively. But the Taliban could move to the north, if they seize power in Kabul and Islamabad, as was almost the case at the beginning of the century. In this scenario, operational rapid-deployment brigades of the Central Asian states, members of the Collective Security Treaty Organization (CSTO), now holding regular exercises, could effectively repel their aggression with the help of other brigades that would be transferred to the region. Military analysts are also worried about the long-term strategy on the Russian-Chinese border. Moscow and Beijing have settled disagreements that could lead to conflict. The two countries have no current territorial claims against each other and are not divided by ideology. They have signed the relevant bilateral documents and maintain partner-like, friendly and almost allied relations. Although current relations are good, nobody knows what could happen in the next 20-30 years after younger and more unpredictable Chinese leaders not concerned with a cordial bilateral relationship take over. Under this concern, Russia would have to deploy strategic nuclear weapons and large military formations in order to counter a hypothetical Chinese threat. Military analysts do not like plans to disband divisions and armies because it would be very hard to reinstate them in case of crisis and because Russia could suffer grievously if attacked. Moscow should assess all possible consequences and find ways of coping with future problems. Analysts say Serdyukov's reforms were not approved by the Security Council, the State Duma or the Federation Council, and that there was no prior discussion involving the military and the public at large. Although Serdyukov claims that President Dmitry Medvedev supports the reforms, such crucial decisions should not be adopted at departmental level. Defense Ministers come and go, but the long-term army reform's future should not depend on their whims.